What are Speech and Language Delays? NDIS? THE FOUR TYPES OF PARENTING STYLES: AUTHORITARIAN, AUTHORITATIVE, PERMISSIVE, UNINVOLVED. LINEA NIGRA: WHAT YOU NEED TO KNOW! 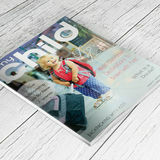 My Child magazine and mychildmagazine.com.au are wholly owned by MyChild Magazine (ABN 79 167 787 662). No other parties or individuals have any financial interest in the company or in My Child or mychildmagazine.com.au. My Child contains general information only and does not purport to be a substitute for health and parenting advice. Readers are advised to seek a doctor for all medical and health matters. The publisher and authors do not accept any liability whatsoever in respect of an action taken by readers in reliance on the recommendations set out in this magazine. Reproduction of any material without written permission by the publisher is strictly forbidden. We cannot accept responsibility for material lost or damaged in the post or for any unsolicited manuscripts and photographs. All reasonable efforts have been made to trace copyright holders. EDITOR’S LETTER Hi Everyone, I love March! This is the time of year that makes me nostalgic. My baby girl Max was born in March and as each year that passes, it reminds me of all the dreams I had about becoming a mother and how those dreams have been surpassed with the reality I have been blessed with. My darling daughter is the wish I wished for (Max even got the eye colour I dreamt of – she has these beautiful blue eyes however both my husband and myself have brown). Max is such a pleasure in my life and her arrival marked the biggest transformation from who I was. Now as an almost 4-year-old, I have noticed that Max has lost her toddlerness this pass few weeks and is now a little girl! She is loving all things JoJo Swia and has been driving me crazy with listening to her music. Every time we get in the car, it’s JoJo time. Now, this wouldn’t be so bad, however my darling daughter loves the music loud and we must look so silly driving around in our little Fiat with the roof down with “Like a kid in a Candy Store” blasting from the speakers.... It is a sight I can assure you, but it’s even funnier when her dad and her are cruising around Now let’s take a look at what’s in the March Issue. This month is the Special Needs Issue month. 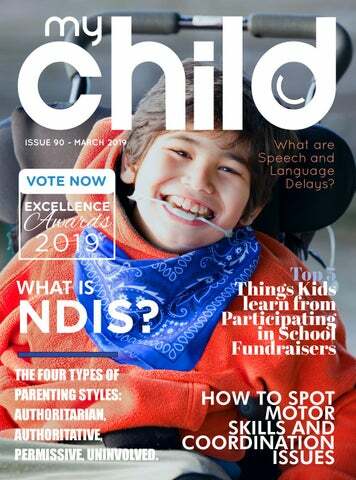 We have some great articles on: What Is NDIS?, How To Beat Caregiver Burnout, Learning Disabilities In Children, What Are Speech And Language Delays?, How To Spot Motor Skills And Coordination Issues. We’ve also covered: Linea Nigra: What You Need To Know!, Braxton-Hicks Vs. Real Contractions, The Four Types Of Parenting Styles: Authoritarian, Authoritative, Permissive, Uninvolved, Simple Ways To Make Reading Fun For Your Toddler , Top 5 Things Kids Learn From Participating In School Fundraisers, Why You Shouldn’t Let Your Kids Win When You’re Playing Games And Keeping Your Marriage Strong When You Have A Special Needs Child All the usuals, interior, reviews blog and much more can also be found in this issue too. FEATURED ARTICLE As parents, we all want the very best for our children. When a child is born with a disability or develops an impairment through illness or injury, it can be a heartrending experience. It may also be difficult to cope with the different needs or added support for the child. This is when the NDIS can be of help. What Is The NDIS The NDIS is the National Disability Insurance Scheme which the Australian government has put in place to help carers when it comes to permanent disability. There is a number of requirements to be eligible for the insurance. If you qualify the insurance can assist with early intervention with regards to developmental delays. The NDIS provides support with regards to cognitive, intellectual, sensory, physical and psycho-social disabilities. The NDIS is not designed to be a welfare system but more as a support to improve skills and encourage independence. The scheme is controlled and operated by the NDIA (National Disability Agency). They make decisions on eligibility and the amount of funding applicants receive. What Support Does the NDIS Offer? When you have to deal with a disability, whether congenital or sudden onset, being able to access information is very important. The NDIS allows you to get the information you need as well as get access to services that can help you and your child. There is a range of services and support available through the NDIS which includes employment opportunities, social participation, education, development of independence and help with living arrangements, health and well-being. What is notable is that the NDIS treats every situation individually. The look at your situation and offer funding and support to best suit your needs. This could mean help to make modifications to your home such as a wheelchair ramp, personal care support, someone to help around the home, special accommodation, technology and equipment needed such as modification to cars, purchasing wheelchairs and more. The NDIS can also help you with early interventions such as behavioural and speech therapy. The main aim of this scheme is to support you and your child and hopefully assist with interventions to improve capabilities and quality of life. They also offer information that can help improve the long term future of a child with a disability such as potential job opportunities in the area. How can you apply? You can ensure that you tick all the boxes for the eligibility requirements by getting the checklist either online or from your local NDIS office. They will ask you for citizenship information, age, the type of disability and what type of equipment is being used for assistance as well as the type of support you are wanting to apply for. If you meet the requirements and are eligible for assistance, you need to complete an Access Request Form (ARF) or make a Verbal Access Request (VAR). Once you have given them all the information they need, the request goes to the NDIA for a decision. They will send you a letter to let you know if you are going to receive assistance. The letter is referred to as an “access decision” letter. If you are approved for assistance, the next step is a planning meeting. They will contact you to set this up. In the meeting, your support and funding needs will be discussed. What is an NDIS plan? Once you receive the “access decision” letter and you are notified of your meeting, you need to lay out a plan in writing. In your plan, you need to make sure that you list what you aim to achieve and what sort of support you need. You will need to make note of the disability of your child or children, what you have at home or what you need to set up. List the daily activities and how they are performed and the sort of support you require to improve on these. You will also need to indicate support you are getting from friends and family that would not require funding. The plan needs to be centred around your child and his or her individual needs. If you need help laying out your plan, officials at the NDIS offices can help you with this as well as advise what the NDIS can offer in the way of support. Over and above funding, the NDIS can help you link up with service providers, people in your community that can support you as well as other government departments that can assist. Coordinators that deal with early childhood intervention assist with children from birth to 6 years. The main aim for the NDIS and the Early Childhood Early Intervention Coordinators is to help disabled children to develop to the best possible levels and be better able to cope with their disabilities. Their aim is to help young disabled children develop the skills they need for their everyday tasks. These coordinators can help you get involved in your local community for information and support as well as get your child involved in community activities. They will assess the support you currently get and help you lay out the support your child needs now and for the future. They will help you determine your family’s needs to be able to support your child as best as possible. The Local Area Coordinators work with children and adults with disabilities from the age of 7 and up to the age of 65. They will assist you in understanding how to set up a plan and access funded support to improve independence and quality of life. They can also help in your progress reviews. Specialised assistance in the form of a Support Coordinator may also form part of your plan. They are available for people in difficult situations who require help in accessing the services and support they need. How is your plan managed? Once a year the NDIS will review your plan. They ensure that it is functioning correctly and actually helping the people involved. Your coordinators will do a review to check what is helping and what isnâ&#x20AC;&#x2122;t. They can then adjust your plan. Where there is no further need for assistance such as a case where early intervention has worked successfully, participants are removed from the scheme. As a caregiver, it is easy to lose yourself in taking care of someone else. You may find yourself stressed and your energy drained. You could be heading towards a burnout physically, mentally and emotionally. You aren’t interested in hobbies or other activities you used to enjoy. You aren’t spending time with family and friends as you normally would. You find yourself feeling irritable or without hope quite often. You find yourself getting sick a lot more than normal. You get angry easily and sometimes irrationally. Your eating patterns change and you gain or lose weight unintentionally. You suffer from insomnia or you want to sleep constantly. You think about hurting yourself or the person you are caring for. Being a caregiver is a stressful thing and you should not feel embarrassed or ashamed if you start feeling like you cannot cope. If you are also having to take care of a home and family or work full time or part time as well, it can become too much to handle. If you feel you are heading for a burnout, here are a few ideas to help you beat the burnout. Organize When you have multiple appointments, chores and tasks to complete in a day, trying to remember everything and get it done in time can exhaust you. Make a to-do list with times and make sure there are gaps for a break or if something crops up that has to be dealt with immediately. You can do this on your smartphone or laptop or the old fashioned pen and paper method. Tick off the tasks as they are completed for a sense of accomplishment as well. Reduce unnecessary tasks and outside commitments to allow yourself enough time to get the daily activities completed. Stay Healthy While being a caregiver and looking out for someone else’s health and well-being you may forget to take care of your own health. You can’t help someone else if you are unwell. You have to ensure you get enough sleep, eat nutritiously and get exercise. Take care of your teeth, your eyes and get your overall health checked regularly. Exercise alone will help reduce stress. Take 20 minutes to do exercise you enjoy such as a walk, cycle or a yoga session. A 10-minute meditation can help you centre yourself and calm your mind during the day. Emotions health Along with physical health, you also need to ensure your emotional needs are taken care of. Connect with friends and family regularly. It will help to have conversations that are not focussed around caregiving now and then. It also helps to have someone who can give you support and a willing ear when you do need to vent about your situation. If you don’t have close family and friends you may want to get involved with a support group in the area or find a counsellor. Having an outlet is essential for your emotional health. Educate yourself Finding out as much as you can about the health issues and other aspects of the problems the person you are taking care of may face or is facing can help a lot. You can find information on ways to mitigate risks and understand all the implications of the illness or disability. You may also learn ways to help the person help themselves, which may take a little of the burden off you as well. Aromatherapy It seems like a simple suggestion but scent can actually help relax you and reduce stress. You can use it in the living area in a diffuser during the day, add some scented oil to your bathtub to relax at night or even a few drops on your pillowcase to help you sleep. Recommended scents include lavender, geranium, chamomile, jasmine, peppermint and lemongrass for stress reduction and calming properties. Take a Break It is very important that you get a break even if it is just an afternoon off once a week. Get a friend or family member to help out so you can get a little time off. If there isn’t anyone to help, looking into a special needs daycare or adult day care centre that could offer a few hours care. Don’t feel guilty about taking the time out to do something for yourself. Your loved one may even enjoy the change in routine as well. If you aren’t sure what to do with your time away, look into having a massage or even a Reiki session to help you relax. Get help Everyone needs a helping hand now and then. Family, friends, community resources and even government assistance should be called it to help you in times when you just can’t cope. Illness, physical and mental reserves being depleted and a lack of time to get everything done are all times when you need to reach out. Join support groups which can help you de-stress and support you as a caregiver. Network with others to learn about essential services that may be available. Recognize the symptoms of potential burnout and get help before it gets to the point when you are seriously ill or you break down physically or mentally. You do not have the bear the burden alone. No two situations are exactly the same, just as caregivers are unique. Look at what works for you so that you are able to relax and recharge now and then. Struggling to pay attention or follow directions Easily distracted, cannot focus A poor memory Unable to stay organized Clumsiness Acting impulsively Unable to express thoughts clearly Acting inappropriately in social situations or at school Speaking on the level of a much younger child Unable to listen properly or understand words and concepts Struggling to deal with change Poor performance at school that does not improve. Different learning disabilities also have their own signs. A person with a disability may show only a few of the signs, so it is best to have your child seen by a professional if you think there may be a learning disability. We take a look at some of the more common learning disabilities in children. Visual Motor/Visual Perceptual Deficit This is a disorder where the information that the person sees is not always understood correctly. They may struggle to copy or draw. Slight differences in printed letters and shapes are missed. The child may struggle to use scissors or hold a writing implement correctly. Eye and hand coordination is often poor. The most common signs of this disability are : •	Reversal or inversions of letters such as p for q or w for m •	Struggles with direction and may get lost easily •	Complains of blurring or itchy eyes when reading •	Holds paper at an angle or turns head at an angle when reading •	May yawn often or close one eye when reading •	Loses place on the page when reading quite often •	Unable to copy accurately •	Struggles with cutting and pasting and holding a pencil or crayon •	Unable to line letters up and use accurate spacing when writing •	Letters may appear bunched together and writing is usually messy Most children who suffer from learning disabilities are at least average to above average intelligence. People will often comment that they are not achieving their potential as there appears to be an obvious discrepancy. Learning disabilities are often not diagnosed and children are noted as being lazy, unfocussed or disruptive. The child often appears smart but are unable to complete tasks at the level they should be capable of. There is no cure for a learning disability. Children with a learning disability will carry this disability with them through life. That does not mean they cannot lead successful, fruitful lives. Early intervention can go a long way to recognizing their disabilities and helping them seek treatment to lessen the effects of the problem on their mental and social growth. It is possible to achieve success at school and in life even when suffering from a learning disability. If you suspect your child may have a learning disability, seek professional help as soon as possible. Experts can help your child learn skills and improve their learning through focussing on their strengths as opposed to their weaknesses. The interventions offered will usually be based on the child and the type of disability. Speech and language delays are a development problem that is characterized by speaking and vocabulary that is not at the expected level when compared with the child’s peers. It is not uncommon and as many as 1 in 10 children share this development problem. These delays can take the form of receptive or expressive delays or a combination of these. A delay in receptive language is when a child battles to understand language. A delay in expressive language is when a child battle with verbalizing. How will I know if my child has a speech and language delay? If you suspect that your child might have this developmental problem, you need to make an appointment with your doctor to assess the situation. Your doctor will listen to the child’s speech as well as run tests to check basic mental development. A hearing screening may be needed. An audiologist would check your child for hearing problems. A speech and language pathologist would be the next step. This specialist will run a comprehensive assessment of receptive and expressive language to work out if your child has a speech and language delay. The assessment focusses on non-verbal and verbal communication. After this assessment, further testing may be recommended. How can I prevent a speech and language delay for my child? There are some causes that cannot be mitigated and there is not much you can do to improve the situation. If your child has difficulty due to hearing loss, implants or hearing aids may help improve your child’s speech and they may be able to reach the same levels as other children their age quite quickly. You can spend time from young talking to your child and encouraging them to interact with you to improve their language abilities. You can talk to your child about anything, just ensuring the words are being said and hopefully understood. If your child speaks to you, listen and respond to encourage them to talk. How can you treat speech and language delays? SFor some children, no treatment will be needed. They may just take a little longer but will start talking normally eventually. If treatment is needed, this will be based on the individual child’s needs. A treatment plan may be laid out with a speech and language pathologist to develop language skills so they can speak and understand better. They can also be taught to read lips. For other children, specialists such as audiologists, occupational therapists, psychologists or social workers may be involved to remedy or mitigate the causes of the speech and language delay. If there is an underlying health problem your doctor may refer you to a neuropsychologist. If this is needed, your doctor can arrange a referral for you. Will my child’s speech and language improve? Some children will catch up on their own. Some children may improve with treatment. Some children face issues such as problems reading or behavioural problems due to the delay in their language development. The sooner a diagnosis is made, the sooner treatment can be implemented and the more likely it is that the situation will improve. Ever noticed that your child has problems with basic ball skills such as kicking, throwing or catching? Do you find that your child battles to sit upright and may appear clumsy when standing or moving? This may be a problem with their motor skills. These are the skills that involve the core stabilising muscles of the body and also includes hand and eye coordination. What is the importance of motor skills? Motor skills come in to play every day for most children. These skills allow them to skip, run, climb, play with a ball and take part in sports. They even affect crucial skills essential for daily living such as getting dressed. They can affect posture and being able to sit upright. Poor motor skills can even effect fine skills such as using scissors, drawing, painting and writing. They can even impact on endurance such as sitting up for long periods or carrying around a school bag all day. When do I need to be concerned? If you have noted a number of these signs and they continue for at least 6 months, you need to consult a professional to discover the causes behind their motor skills and coordination problems. In babies, you may want to discuss issues such as missing developmental milestones even sooner. What are some of the causes of motor skills and coordination issues? Dyspraxia: This is a common condition where the brain and the muscles are not in synch and it can make even simple movements difficult to carry out. This affects the fine motor skills such as writing as well as gross motor skills used in running and playing ball. Dyspraxia can also cause problems with balance, coordination and even speech. A child may show some or all of these symptoms and the problem can be mild to severe. The condition can also change over time. Dysgraphia: This is another condition which affects fine motor skills. Children with dysgraphia often struggle to hold writing implements properly and their handwriting is usually messy. They may also struggle to tie their laces and similar tasks. Sensory Processing Issues: This condition affects eye and hand coordination in particular. Children with this condition may also be clumsy and fall a lot. They may battle to skip or walk. They may also exhibit extreme reactions to sound and touch. How can I find more information? The first step would be to talk to your doctor about having your child assessed. You may also want to share your concerns with your childâ&#x20AC;&#x2122;s teacher who may be able to give you more insight into the childâ&#x20AC;&#x2122;s problems at school as well as offer resources that can help. Your doctor may recommend ruling out any medical causes. If nothing comes up, he may then refer you to specialists such as an occupational therapist. How can I help my child? Whether or not your child has a condition which is causing the problem with motor skills, you can help improve his skills by encouraging play which improves balance and motor skills such as skipping. Stay positive and encourage your child. Understand that your child may be struggling and needs your compassion as well. Connect with other parents who may be dealing with similar issues. Networking in this way may bring to light new strategies and ideas. It also gives you some support and makes you realise that you are not alone. Most children do not outgrow their problems with coordination and motor skills but their skills can be improved. Therapy and support from you can help your child gain more confidence in their abilities. Improved motor skills and coordination improves confidence and self-esteem as well. There will be plenty of challenges ahead, but with guidance and support, you and your child will get through them. Your body undergoes a vast array of changes while you are pregnant. You may find hair growing where it didn’t before, your organs may be in places they are not used to being, you might crave the strangest things and for some women, they even experience colour changes to their labia from pink to bluish in colour. Another colour change which is a lot more common is a line which runs down the belly, which is known as the Linea Nigra. What is the Linea Nigra? It is theorized that the body may produce more melanin (skin pigment compound) during pregnancy which results in the line which usually runs from the belly button down to the top of the pubis, although it can extend upwards as well. This line is usually unnoticed and is where the connective tissue of the abdominal muscles meet. The fluctuating hormones in the body may be the reason for the excess melanin. It doesn’t matter what colour your skin is naturally, you can still develop a Linea Nigra (Latin for black line) although it presents more often in women with darker skin tones. Women who develop a Linea Nigra often experience other skin colouration changes such as on the areola and face. Up to 75% of pregnant women will experience some skin pigment changes. It is completely natural and of no concern to your baby’s well-being. How long before it goes away? Some women enjoy the look of their pregnancy stripe but it is a temporary addition to your belly. The Linea Nigra will start fading once your hormones start settling back down and will be gone within 3 months after having your little bundle of joy. Can I prevent it? The Linea Nigra is not preventable and is perfectly normal during pregnancy. There is nothing that prevents it and once you have it, it has to go away naturally. Do not use bleaching creams or lighteners on your belly while pregnant or breastfeeding. It is unlikely to change the look of the Linea Nigra but it can potentially harm your baby. Once you have had your baby, and only if you are formula feeding, you can try a skin lightener, fade cream or topical retinol to lighten the skin but there is no need to use chemicals on the line. Some women swear by rubbing a little lemon juice on the skin to remove the hyperpigmentation, but there is no scientific proof of this phenomenon either. The best way to treat your belly during pregnancy and breastfeeding is to gently exfoliate and rub your belly with a blend of cocoa butter and vitamin E. This will keep your growing tummy nice and smooth and may also help with stretchmarks without doing any harm. Keep the belly unexposed to the sun without strong sunscreen. It is preferable to keep your tummy covered while you are in the sun. A tan on the skin can make the Linea Nnigra present even darker. Don’t use tanning beds during pregnancy and avoid them until after the line has completely faded. Myths of the Linea Nigra IAlong with tales of determining the babies gender by how you are carrying or what your cravings are, comes the myth of the Linea Nigra. The theory is that the Linea Nigra can determine whether you are having a boy or a girl. If it is a boy, the line will extend past your navel and upwards and in the opposite direction if you are having a girl. This myth proves true about half of the time, the same as other stories. Nowadays, if you want to know the gender, it is probably easiest just to ask during your scans. Your body may go through many strange and wonderful changes while you are pregnant, but rest assured, most of these changes will disappear within a few months of having your little one. For some women, there will be reminders such as stretch marks or scars, but the Linea Nigra is not going to be one of them. It will fade away naturally, leaving your tummy unstriped (or not so you would notice) until the next time. Every pregnancy is different, whether it is your first or fourth, just like every woman is different too. Not all women experience all the symptoms of pregnancies and then you get women that experience them all. It can be quite an uncertain time in your life because you don’t know what to expect. Braxton-Hicks Contractions is one major cause of distress in parents-to-be because it often gets confused with real contractions. It is important to know the difference between these two, but each plays a vital role in bringing your baby into this world. Braxton-Hicks Contractions Braxton-Hicks can often be misinterpreted as real contractions and women can find themselves sent home from hospital because they are not really in labor. There are a few differences between these two types of contractions. Braxton-Hicks Contractions are your body’s way of preparing and practicing for labor. It can feel like menstrual pains or a tightening in your abdomen. They do not last long and they are usually not painful, although they can be uncomfortable. You can experience Braxton-Hicks Contractions in your third trimester, but they can start in the second trimester. You do not need to worry that Braxton-Hocks Contractions will lead to labor; your body is practicing for when it really needs to start the labor process. It can happen quite often during the day. If you had a busy day and you experience Braxton-Hicks Contractions try and relax by putting your feet up or taking a warm bath. Changing positions can also relieve the contractions. The thing about Braxton-Hicks Contractions to remember is that the cramps won’t get worse and it won’t happen in regular sequence. They happen randomly and they are not too painful. Many women don’t even feel it or know what it is. We’re all perfect parents – full of ideas on how to do it best - until we have our own, that is. Then most of us find parenting demands a more complex skillset than we’d anticipated. Decision fatigue, inconsistencies due to being human, or simply being exhausted and outnumbered – many factors stand in the way of being an effective caregiver at times. We start out wanting to be good parents. Exactly what ‘good’ looks like is not always clear, and even if we could agree, simply knowing the ‘best’ approach, doesn’t mean it magically channels itself into our brains – we’re all influenced by our own experiences of what parenting looks like, and are limited by communication styles and temperaments. What the experts do agree on, is that the way you parent has life-long influence on your child’s self-esteem, relationships – even their weight. No pressure! So, what do the experts reckon? Research that began in the 60’s came up with four clearly defined styles of parenting; authoritarian, authoritative, permissive and (the newcomer) uninvolved. And while aspects of all styles may come in to play at different times in our lives (or different challenges in the day), most parents tend to find characteristics of one overarching style best describe their approach. Authoritarian Obedience: ‘No ifs, buts or maybe’s!’ Instead of including children in decisions, the view is that kids should be seen and not heard, do as they’re told – or else. ‘I told you so’ is the main explanation for rules. No negotiation. No exceptions. Rather than teaching a child to make better choices, they’re invested in making kids regret their mistakes. This ‘strict’ style was employed by many baby boomers to raise their (now adult) kids. Punishment is preferred over ‘new age’ star charts and other ‘soft’ approaches that they feel do not instil enough discipline. Children who grew up with parents with these attitudes tend to follow rules, but at the cost of their self-esteem as they learn their opinions aren’t valued. Anger, lies and deception to avoid punishment are also more likely behaviours of children raised in these dictator-like households. Signs that this may be your MO include; incessant nagging, barking orders constantly, making every activity a learning experience, listing rules of the house, having a zero tolerance for silliness, making outrageous threats and rarely offering choice. Authoritative Consultation: These are the parents that bend down calmly to their child and explain the reasons behind their request (most of us do this in public all the time!). Positive Relationships are paramount for this parenting style, which includes explaining the meaning behind the rules, enforcing consequences for breaking them, and teaching children alternative choices. While they still make clear that adults are in charge, authoritative parents validate their child’s feelings during the process. They’re about preventing challenging behaviour through praising often, ‘catching’ their kids doing something good, and designing star charts and other reward systems that focus on the positive. They exhibit warmth and understanding and communicate their expectations calmly. Children growing up within this calm, consultative environment are more likely to be happy, successful, more securely attached to caregivers, become better decision makers and make safer choices on their own because they have the confidence to try. Permissive Indulgence: ‘Kids will be kids!’ Permissive parents are often very loving and nurturing, offer treats and toys. Punishment and rules are rarely given or enforced as they feel their child will learn best by figuring it out for themselves without them interfering. Permissive parents are rather lenient, only stepping in when there is a serious problem, and even then, may give in if the child begs. More friend than parent, they are interested in being popular rather than enforcing rules and usually allow their children to make most decisions in their lives. Any child would love to get permissive parents who let them live on junk food and play the iPad all day, right? In fact, children with lenient parents often struggle at school as they have little structure or routine in their lives, develop weight and dental problems (as parents let them eat whatever they want) and, because they had little expectation placed upon them, have little to strive for. Having their way most of their lives, many struggle with the realisation that you can’t always get what you want, and as adults, often, bleakly, turn to substance abuse. Uninvolved Dismissive: These parents are too overwhelmed with their own lives to have the emotional energy to tackle parenting, and simply expect kids to fend for themselves. They aren’t demanding, threatening or violent, they simply aren’t responsive to their child’s needs. They provide little guidance, supervision or support and may become emotionally distant, and even deliberately avoid their kids. While this sounds dreadful, often parents become inconsistent in their availability to parent, or completely uninvolved due to health problems, substance abuse, custody battles or excessive work to reduce financial stress – factors that often are beyond their control. Nevertheless, neglectful parenting results in unhappy children who do miserably at school with frequent behavioural problems. Often adults who parent in this manner were raised by rather dismissive caregivers and had poor relationships with them – and so the cycle continues. While most of us can pick our usual MO, we are human, and even the most competent parents find themselves becoming unreasonable and impatient when stressed (or perhaps slip into permissive complacency on a Friday night after a glass of wine). There may also be periods where we are less involved than we hope to be for various reasons beyond our control. Establishing a love of literacy starts very young. As a parent, we all want our kids to succeed and prosper in life. Giving a good grounding in reading at the start of their lives can pay off enormous dividends later on in life. It is also a wonderful way to bond and spend quality time with your little one. Toddlers can be a handful and reading with your small ones may seem more like a chore than fun at times. The best way to get them interested is to get them involved and make reading fun. Here are a few ideas of how to make reading fun your toddler. Make books accessible If you are worried about damage, start them off with cloth or vinyl books and progress on to board, hardcovers and paperbacks. Bright colours and a variety of books to choose from is a good way to build your toddler’s knowledge without it becoming boring. They will usually have a few favourites that you can always grab for a quick read. If affordability is a problem, you can always shop at used bookshops, markets or even online. Put the books where the little ones can see them, touch them and explore for themselves. Lead by example Children love to copy what we do. Show them how much fun reading is by reading yourself. Even if you don’t enjoy novels, brightly printed magazines are a good way to show your toddler that reading is something good to do. Read aloud There is no need to restrict reading to bedtime. Why not have older siblings read aloud to your toddler while you prepare breakfast? Older children can read to the family pet to encourage reading aloud without concern for judgement. Have a family book reading get together where everyone gets to read a page and then passes the book along. Get your toddler to “read” a page as well, with your help. Read books with rhymes that your little one can learn and “read” back to you. Have your toddler sit on your lap and point out things in the pictures and turn the pages for you. The more involved they are, the more fun it will be (for everyone). Reading everywhere Books are portable entertainment. Take one with you on outings. You can read to your toddler while you wait at the doctor’s office or in a restaurant. Take your books with you on holiday so you don’t miss out on the daily reading time. If you go on an outing to the zoo, take a book of animals with. This helps relate the animals to the words and the pictures. You can even take a well-behaved toddler to a local library’s story hour. Bring the book to life In the same vein as taking an animal book to the zoo, you can read the book at home before a visit to the zoo. Your toddler can then see the book animals come to life. Or read a book about trains and then take them to see a real train. Bringing the books to life will make them more interested in reading the next story to be able to relate it to real life. Empathy Young kids who take part in fundraisers can learn the valuable life lesson of being able to understand the difference between empathy and sympathy. This can help give them a wider perspective on the world and the potential to build strong connections with others more easily. Children are not born with empathy, it is a skill that they can learn and acquire from a variety of situations in their early years. For example, fundraising activity involvement can help develop a child’s empathy and children who are empathetic are reported to potentially do better in school, in social situations and in their adult careers. Philanthropy Children who take part in Philanthropic activities such as fundraisers can feel more connected to the wider community and potentially are able to acknowledge the differences between people and putting others first. Exposure to Philanthropy at a young age potentially leads to them taking a stand and developing leadership skills early on. Children as young as 5 have been reported to have an emerging sense of self and are at an age that is potentially appropriate for growth and achievement through new challenges such as fundraising. Community Values Fundraising initiatives within schools can encourages a sense of community between the pupils and the staff, in the same way that when a parent and their child get involved in their local neighbourhood charity drive, they can feel closer to their community. This involvement helps re-enforce important values to the child, such as caring for others in their network and to have compassion and resilience. Fundraising activities have the potential to bring entire schools, neighbourhoods and communities together. Social Conscience A child’s conscience is formed through three processes that happen during the early and middle years of their lives, so it’s important for them to be involved in activities that help progress and develop these first stages of their social conscience. By being exposed to charity fundraising, children can learn how they can help others. When educated on how their contribution helps, it allows them to put themselves in someone else’s shoes, someone who may not be as fortunate as them. This potentially contributes to developing a child’s social conscience and perception of the wider world. Getting your child to participate in charity fundraisers isn’t as hard as you may have imagined. There are many fundraiser’s that you can participate in as an individual, as a family or even as a school group. One example of a charity fundraiser that you should consider getting your child involved in is the World’s Greatest Shave. The World’s Greatest Shave is the Leukaemia Foundation’s biggest annual charity fundraiser and takes place from the 13th - 17th March 2019. It’s a great way to introduce your child to the fun, excitement and fulfilment that you feel when participating in fundraising activities. This fundraising event has seen a significant 63% increase in children participating and with a goal of raising $16 million in 2019 that will help provide support, education and services to Australians that have been diagnosed with blood cancer, there is no time like the present to get your child involved. If you want to find out more or register your child, yourself, your family or maybe even get your child’s school involved, simply visit https://worldsgreatestshave.com/ or call 1800 500 088 to speak to the one of the friendly team who will help with your queries..
A Little Bit About the Leukaemia Foundation! The Leukaemia Foundation is the only national charity dedicated to helping more Australians survive blood cancer and live a better quality of life. Leukaemia, lymphoma, myeloma and related blood disorders are all types of blood cancer, which can develop in anyone, of any age, at any time. More than 100,000 Australians are living with blood cancer or related disorders, and the equivalent of one person every 41 minutes is diagnosed. Although research is improving survival, sadly an Australian loses their life to blood cancer every two hours, claiming more lives than breast cancer and melanoma. For more information, please visit leukaemia.org.au or call 1800 620 420. A common question I get from Dads is: “ Should I let my child win at games?” The simple answer to that is “Sometimes”. You may look at you little one, those uncoordinated hands and legs, those big eyes and undeveloped minds and feel like you are obligated to let them win. You don’t want to damage their psyche right? Will beating them at games harm their egos and give them insecurities they carry with them for life? Games can be life lessons as well as fun times spent with the kids. Teamwork and sportsmanship When kids are small, around the toddler age, games are not really about winning and losing. The focus is on sharing and taking turns. This is the time for them to learn to play well with others. There is no real competitiveness yet. Focus the games on spending time together and having fun. When they get a little older and a skill element is introduced in to the games, things start becoming a little more competitive. This usually happens around preschool age. This is when you focus on playing by the rules. Playing by the rules Once you get to the competitive aspect of games and there is winning and losing involved, things change a little. Kids need to learn that there are rules to the games as well as how they play the games. They need to enjoy the thrill of winning but also to be able to accept defeat well. At this point, you may want to let them win now and then so that you can lead by example. Show them good sportsmanship and how to accept a loss with dignity. My child is a sore loser When kids are younger it can be hard for them to articulate their feelings. Losing can lead to a fit of rage if they don’t know how to cope with it. Talk to them about it. Calm them down and get them to say how they are feeling. You can then explain that games are meant to be fun. Compliment them on where they did something well during the game. You are the example to them of handling winning and losing. Tell them stories of your own failures. Explain that not everyone is alike and we are all good and bad at different things. Teaching a child to cope with losing will build a strong character trait. My child is a bad winner Sometimes a lesson in humility is called for. You may need to play games that give the child an awareness of how it feels to lose. Talk to them about losing and how it makes them feel. Knowing how it feels to lose develops empathy for opponents and may mitigate bad behaviour when winning. It is important that your child learns to win well and lose well. Losing helps build character and empathy. It helps the child deal with adverse situations in a more controlled way. They learn to express themselves better and handle disappointment, which is guaranteed at some point in life. Help build a strong team player with good ethics, who plays by the rules. A child that knows that it is not all about winning or losing but about how you play the game. Marriages are not all sunshine and roses. For better or worse may include a lot of “worse”. Marriage takes work and for both partners to step up. When you add kids to the mix, things can get even more complicated. When you add in a child with a disability, the stress is amplified even further. You love your child, you love your partner but there is just so much more to deal with when you have a special needs child. Worrying about your child’s health and wellbeing, visiting therapists and doctors, fighting with the insurance companies, dealing with issues at school. There are so many problems that can cause irritation and stress. This can often result in partners snapping at each other or taking out their frustration on their spouses. Taking care of a child with special needs can also be physically exhausting. You may have to do a lot during the day and may also not sleep well at night. Sleep deprivation and tiredness can also make you very grouchy and your partner may take the brunt of your moods. Sometimes one partner can put so much into the caring of the special needs child that they cut themselves off from their partner. There is minimal interaction and the connection between the two people disintegrates over time. Things can be a lot more difficult between partners with a special needs child than in most households. There is often a lack of time and even a lack of finances. You have to accept that this is going to be tough, but as partners, you can use this challenge to develop a stronger partnership instead of letting the struggles push you apart. There are ways you and your partner can increase your bond of marriage even with the added challenges of taking care of a special needs child. Parent partners Stop being parents all the time, sometimes you need to be partners. Make time during the day to connect to each other as people and use this time to talk to each other about your relationship and each other. Keep the household and children conversations for later. Celebrate your differences You may not always agree on raising your child or children. You may argue about the running of your household. You may have different expectations when it comes to treatments for your special needs child. You may even have differences in how you feel about your child’s diagnosis. One view is that you should tolerate the differences between you. A better way is to celebrate the differences. Stand in your partners shoes and embrace their thoughts and emotions. See things from their perspective. You do not have to think alike to love each other. Embracing the differences will also help you reach compromises. Be proactive If there are household or childcare niggles, don’t let resentment against your partner build up. If either of you needs help, you need to talk to your partner. Sometimes just having the discussion will be enough to resolve the little issues which could have become ticking time bombs in your relationship. Don’t get angry. Have a conversation, not a shouting match and you are more likely to sort things out. Don’t lose that loving feeling You may not be able to schedule a date night once a week, but that does not mean you can’t be romantic. You may have to be a little more creative, but the benefits far outweigh the input. Take a candle-lit bath together. Spend a few minutes sitting on the swing together holding hands. Don’t be afraid of little hugs and glances of affection. You have to make time for each other. As difficult as it can be, you need each other and making sure your bond is strong will help make your relationship last. Appreciate each other You both need to be involved in the care of the special needs child. While one partner may need to take on extra burdens with regard to therapy and caring directly for the child, the other partner can take up the slack in other ways. Both parents need to be involved with the child, besides developing a bond with your child, it is important to give your partner a break now and then. Appreciate what you both do in the home and out. Say thank you and give credit where it is due. Knowing you are loved and appreciated by your partner makes you feel more united. A marriage is a journey meant for two people. The challenges and struggles belong to both of you, in the same way as the celebrations and good times do. Love your children together, but never forget that you are partners too. Make time for each other, appreciate each other and work together to overcome all obstacles. Geelong mum, Vanessa Eldridge, and Managing Director of b.sirius, is a butterfly in the design world. In 2017 she left her corporate job to follow her passion for creativity. After completing her degree in Occupational Therapy and moving to Melbourne, Vanessa and her husband, Justin, felt Geelong was the perfect place to raise their children where she practiced rehabilitation and management. She found her work “extremely rewarding, as I helped people achieve their personal goals.” But after becoming restless in her everyday job, and seeking something more flexible so she could give more to being a mum, Vanessa felt that it was time for a new venture, “I’d always loved craft, fashion and design but never thought of it as more than a hobby.” From a very early age she has been described as a butterfly, being able to “move from one project to another, never satisfied, forever growing and changing, grasping at opportunities with both hands.” As such, her next new venture b.sirius was born. Vanessa has always felt the need to help people who need it most. Part of her business model was to align to those who need her help, including partnering with a not-for-profit organisation that employs people with disabilities to provide meaningful work and an opportunity to enter the work-force. ”They store, pack and dispatch all of my orders. I’m committed to helping people to foster their confidence by providing them with employment opportunities. So this way, I’m using my Occupational Therapy skills, my passion for creativity and my business skills”. Vanessa finds inspiration in nature that surrounds her and aims to create collections of original bags and accessories that are both fashionable and long-lasting for the modernday woman who loves functional fashion – rather than fast-fashioned pieces. “My latest new item, the Big Bag, can be a nappy bag or an overnight bag – because I like things that have multiple purposes and that are affordable”. When designing each new collection , she always remembers that “I’m the kind of woman who invests in trusted brands and products that serve me well and make me feel good… things I know that will last me for a while!” Vanessa believes that her path to b.sirius has been a way to reinvent herself, “growing from the chrysalis to the butterfly,” she says. While many people fear the idea of change, it’s what inspires Vanessa to continue chasing her dreams. One of her strengths lies in her ability to keep a work-life balance, ensuring that she can spend time with her husband and daughters, Millie (12) and Lucy (9), sometimes bringing them into the design process. “When I was younger, my mum and I bonded over our love for craft and design. I love that I can teach my own daughters these same skills.” Their latest project? Making mosaic artworks for their garden at home. Vanessa inherited her love for design and art from her mother and felt it was time to turn that passion into a full-time career with b.sirius now available in over 150 stockists in Australia and New Zealand and continuing to expand globally. Natural earthy colours, durable materials and affordability are all signature traits of b.sirius products. Vanessa aims to maintain the highest quality in all her designs, while also only using ethical materials and ethical manufacturing processes. “I’ve always loved nature. Each of my designs is inspired by what surrounds me, and I pride myself on using only vegan materials.” Vanessa’s two tips for launching a business: embrace your individuality and persevere, “Trust in yourself and stay true to your values. There will definitely be days when you just want to give up, but if you push through, you will flourish.” And, what does 2019 hold for b.sirius? Vanessa has big plans, including the recent launch of the Autumn/Winter 19 Collection and a brand new website, “I want b.sirius and myself to keep evolving”, all while staying true to her signature style. The best option for ensuring the safety of your child, is to go with a cordless window covering. Eliminating all dangling cords ensures that no child can grab or tug on the cords and prevents strangulation. Window covering cords and chains are by nature very strong and loose cords or chains within reach of children can be fatal. If you do purchase corded or chain window coverings, ensure child safety devices are installed and that all cords are mounted out of reach (a minimum of 1.6m from the floor) and safety guidelines are left attached to the cord. Veneta understands the importance of selling child safe blind products and this is why we have a range of Cordless and Motorised Honeycomb Blinds that require hand or remotecontrol operation. By eliminating cords or chains to operate a blind, you can reduce the risk and potential danger to younger family members and pets. TIP: Keep all furniture (cribs, changing tables, armchairs) and anything climbable away from window coverings to prevent easy access. Honeycomb Energy Efficient Benefits As much as 50% of your homes heating and cooling energy may be lost through your windows. Uncovered glass windows and doors act as large holes in the home, which can cause heat transfer and contribute to a high level of energy loss. This results in a reduced effectiveness of your homes heating and cooling energy. By covering your glass windows and doors, you can protect your home against heat loss in winter and unwanted solar heat gain in the hot summer months, creating a comfortable indoor living environment, all year round. This is particularly important for a nursery or a small childâ&#x20AC;&#x2122;s bedroom, where controlling the temperature of the room throughout the day can be a tricky task. Light Filter – Energy Efficient Light Filter fabric offers full privacy as well a great amount of light into the room. An excellent choice for children’s playrooms. Blockout – Super Energy Saver Blockout fabric is a cost-effective insulator with a slimline profile and is great for darkening a space. This is a superior choice for a nursery or a child’s bedroom. It’s double the fun with two little girls who love their lip gloss (yes, I’m raising two little princesses!) and throwing bouncy balls. There’s something about bouncy balls it seems, that creates never ending fun in my house. Or maybe it’s because they can just split the ball open and put lip gloss on whenever they want. Either way it’s a winner here. The only downside is the very obvious split created for the lip gloss to sit within the ball. But it hasn’t deterred my girls and the fun continues. THE HUG By Eoin McLaughlin & Polly Dunbar The Hug is two stories in one sweet little book. When read from one end, it tells the tale of Hedgehog, who is feeling sad and desperately in need of a hug, but unsurprisingly, it proves impossible to find an animal willing to hug him. When read from the other end, we discover that tortoise is also in search of a hug to brighten his day, and similarly, none of the animals want to hug his hard shell. But when the two animals meet in the middle pages, we find the real magic of this adorable book, which will be enjoyed by young readers aged 2-6. From the author/illustrator of last year’s beautiful book We Are Together comes this visually stunning nonfiction book dealing with all things fish-related. Primary school-aged children will love poring over all the details – discovering what’s inside a fish, the types of fish that live in different bodies of water, how fish live, and what they need to survive. The book is filled with many interesting facts to satisfy curious young minds, and Teckentrup’s signature vibrant illustration style brings the fish to life, so that they seem to be almost swimming off the page! THE MAN WITH SMALL HAIR BY JANE JOLLY & ANDREW JOYNER This fabulous Australian book is a tale of individuality which will be enjoyed by children aged 3 and up. The man with small hair just wants to fit in with the people in his town, who all look almost identical to each other. And so he grows his hair and hides away his favourite clothes and shoes, until one day upon looking in the mirror, he feels as though he has completely lost all sense of who he really is. The book shares a fantastic message of selfconfidence, bravery, and celebrating the things that make each person unique. Puff Pastry Waffles Directions 1. Line a cutting board with parchment paper. 2. Unfold puff pastry onto cutting board. 3. Cut each sheet into 4 equal squares. 4. Preheat a waffle iron according to manufacturer’s instructions. 5. Grease with cooking spray. 6. Place one puff pastry square in the preheated waffle iron; cook until golden brown, 3 to 5 minutes. 7. Repeat with remaining puff pastry squares. Directions 1. Grease and flour two 8 x 4 inch pans. 2. Preheat oven 165 degrees C 3. Sift flour, salt, baking powder, soda, and cinnamon together in a bowl. 4. Beat eggs, oil, vanilla, and sugar together in a large bowl. Add sifted ingredients to the creamed mixture, and beat well. Stir in zucchini and nuts until well combined. Pour batter into prepared pans. 5. Bake for 40 to 60 minutes, or until tester inserted in the center comes out clean. Cool in pan on rack for 20 minutes. Remove bread from pan, and completely cool. Directions In a medium bowl, whisk together the sesame seeds, poppy seeds, sugar, olive oil, vinegar, paprika, Worcestershire sauce and onion. Cover, and chill for one hour. In a large bowl, combine the spinach, strawberries and almonds. Pour dressing over salad, and toss. Refrigerate 10 to 15 minutes before serving. â&#x20AC;˘	DIRECTIONS In a large pot over medium heat, melt butter. Cook onion and celery in butter until just tender, 5 minutes. Pour in chicken and vegetable broths and stir in chicken, noodles, carrots, basil, oregano, salt and pepper. Bring to a boil, then reduce heat and simmer 20 minutes before serving. DIRECTIONS 1. Preheat oven to 450 degrees F (230 degrees C). Line a baking sheet with aluminium foil and grease with cooking spray. 2. Combine olive oil, garlic, salt, and pepper in a bowl. Add cauliflower, tomatoes, and garbanzo beans; toss until well coated. Spread in a single layer on the prepared baking sheet. Add lime wedges. 3. Roast in the preheated oven until vegetables are caramelized, about 25 minutes. Remove lime wedges and top with fresh coriander. Tres Leches (Milk Cake) Directions •	Preheat oven to 175 degrees C. Grease and flour one 9x13 inch baking pan. •	Sift flour and baking powder together and set aside. •	Cream butter or margarine and the 1 cup sugar together until fluffy. Add eggs and the 1/2 teaspoon vanilla extract; beat well. •	Add the flour mixture to the butter mixture 2 tablespoons at a time; mix until well blended. Pour batter into prepared pan. •	Bake at 175 degrees C for 30 minutes. Pierce cake several times with a fork. •	Combine the whole milk, condensed milk, and evaporated milk together. Pour over the top of the cooled cake. •	Whip whipping cream, the remaining 1 cup of the sugar, and the remaining 1 teaspoon vanilla together until thick. Spread over the top of cake. Ice Cream • DIRECTIONS • Beat milk, light cream, sweetened condensed milk, and eggs together in a bowl on low mixer speed; slowly add sugar while continuously beating, followed by vanilla extract. • •	Pour milk mixture into ice cream maker’s container and freeze according to manufacturer’s directions. Favourite baby swaddle product continued. Favourite baby sleep suit product continued. Favourite baby thermometer product continued. Favourite baby safety product continued. Favourite baby steriliser product continued. Favourite baby resusable nappy continued. Favourite nappy rash cream continued. Favourite child travel product continued. favourite sun protect product continued. Favourite teething teething product continued. Favourite product continued.